Painting...one of Albert Brenner's many creative passions developed while he was an art student at The New York School of Industrial Arts, and has continued throughout his life and career. Mr. Brenner worked in window display for major New York department stores following graduation and then, after serving as an Air Force gunner during World War II, he attended Yale Drama School of Graduate Studies as a scenic design major. Later at the University of Kansas City in Missouri, he taught scenic design, costume design and technical theater before returning to New York. There he began working in scene design, which segued into live television for CBS and ABC, and then motion pictures. Fail Safe marked Mr. Brenner's first full-length feature film design credit. While still working on this first film, he was hired for a second, and then a third and a fourth... Now forty films and five Academy Award nominations later (The Sunshine Boys, The Goodbye Girl, the Turning Point, 2010, and Beaches), Albert Brenner is devoting all his energies to painting and sculpting in Italy. As a scenic designer, Mr. Brenner designed and painted backdrops for theater and television. As a production designer, he designed and rendered countless interiors and set sketches for his films. 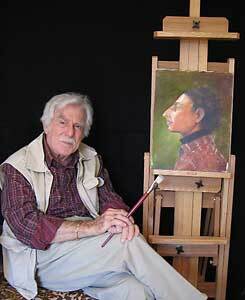 In his spare time, he began painting "for himself" in watercolors and oils, began sculpting, and has never stopped. While Mr. Brenner's paintings are mostly still lifes, he also enjoys figurative work, which reflects his other passion, sculpture. Mr. Brenner believes that his art, as his production design, is but one of the many of his life's voices. Through the particular temperament of his voice, Mr. Brenner is striving to create an environment in which the viewer can see further than the material to discover that which struck his artistic sensibilities at the moment he observed and sculpted or painted his subject. He believes that the search for truth and beauty lies not in slavishly reproducing reality, but in interpreting that which nature provides. A signature member of the California Art Club, and an associate member of the National Sculpture Society, Mr. Brenner twice won first place at the CAC Annual Gold Medal Exhibition, a Silver at the California Discovery Awards, and had been exhibited at the Palm Springs Desert Museum, the Carnegie Art Museum and the National Sculpture Society, as well as galleries in Laguna Beach, CA, Scottsdale, AZ, and Lambertville, NJ. Mr. Brenner divides his time between Los Angeles and Pietrasanta, Italy.